In 1988 Rolex launched the first automatic chronograph and the era of the Rolex Daytona 16520 began. 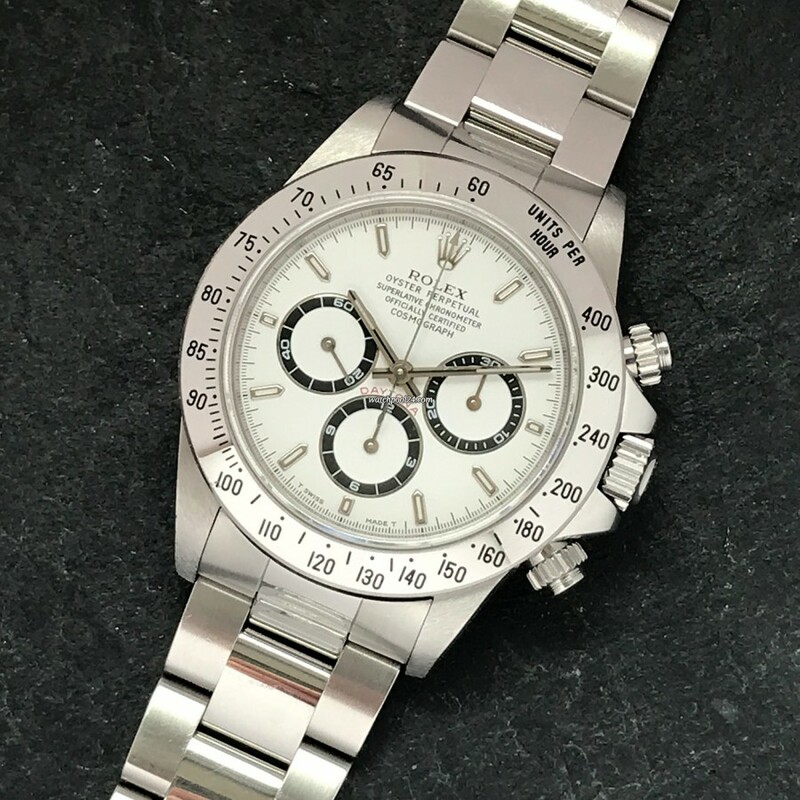 This Daytona Series is also referred to as the "Zenith" Daytona due to the calibre 4030, which is based on the robust Zenith El Primero movement. 1999 was the last production year of Zenith-Daytonas, as in 2000 Rolex launched its own automatic movement. Here we offer you an outstanding example of this iconic chronograph in stainless steel with a white dial. This watch has a very balanced and noble look. Especially from the collector's perspective, this Cosmograph including its full set is a rare and sought after piece. The original chronometer certificate is punched with the serial number and the country code 100, which stands for Germany. According to the original papers this watch was sold in December, 1998 by WEMPE in Dortmund, Germany to its first owner. In addition, other accessories are available: hang tag with the matching serial number, original Rolex box. The condition of this reference 16520 is an absolute highlight. The green Rolex hologram on the case back with the serial number 16520 is still available and proves that this watch was hardly worn. The Oyster stainless steel case is unpolished and has razor-sharp edges. The white dial is absolutely immaculate and the black rings of the sub-dials provide an unmistakable contrast. The large, screwed Rolex Triplock crown and the screwed chronograph pushers make the case waterproof. The bezel is in excellent condition. The Oyster stainless steel bracelet is in a great condition and the engraved numbers correspond perfectly to the era of the watch. Bracelet reference number: 78390, end links reference: 503B, clasp code: Z6. This Rolex Daytona 16520 offers a lot of strong arguments: beautiful design, sophisticated technology, rarity, great condition, papers. All in all a coveted collector's watch.